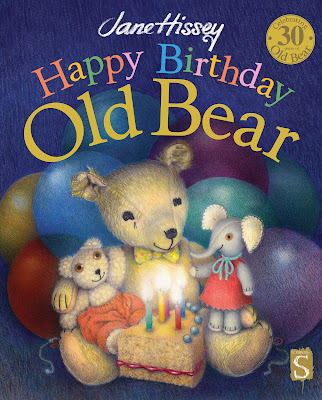 To celebrate the thirtieth anniversary of Old Bear and friends, Jane Hissey has created an entirely new adventure featuring the beloved characters, filled with the charm and beautiful illustrations for which she is acclaimed. The toys are getting things ready for Old Bear’s birthday party, helped by their new friend, Elsie the elephant, who plans on giving him a painted umbrella as a gift. When they head into the garden, Elsie and her umbrella are blown away by a gust of wind and must be rescued! I'm delighted to review this book as part of Old Bear's 30th birthday! I grew up with Old Bear, or more accurately my older sibling did. They collected all the toys which accompanied them on hospital visits. I read the books, but not avidly as Old Bear isn't quite my favourite style of illustration (sorry Jane...). However, it gets top marks as it's awesome, reminds me of my childhood, and makes me style. I love the new to me (I don't recall seein er before but my memory is lousy) character Elise, she is daring, enthusiastic, sometimes doesn't think things through but embraces life as an adventure. My sibling's favourite toy was Little Bear. 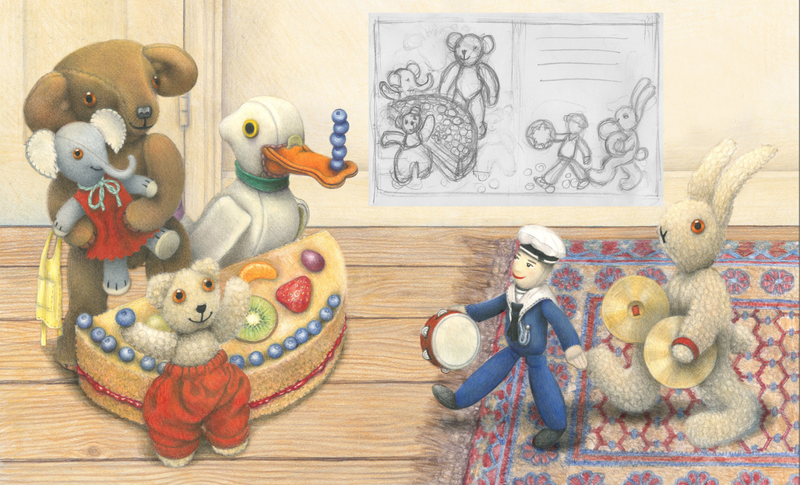 It's heartwarming to see the toys eager to create a good time for Old Bear, they go through all aspects of birthdays including mishaps, which get cleverly redesigned to become something even better than the original. 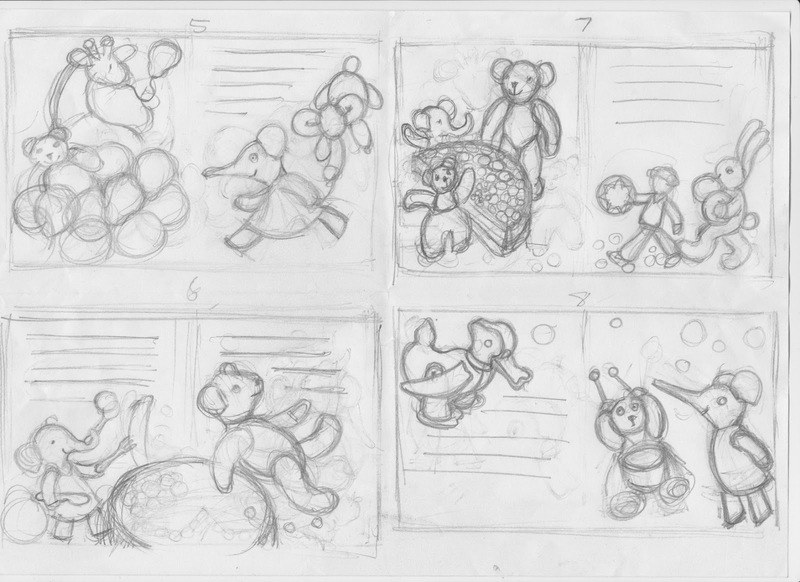 It's a real pleasure to present you with this guest blog post from Jane which includes exclusive rough drafts of actual pages within this book! I did show them to my family as soon as I got them because I'm not the only one with fond memories of Old Bear. I think you will agree they are ace! 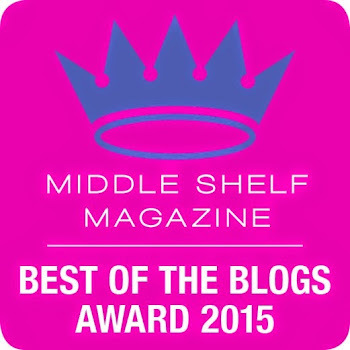 Find out more on Jane's website. 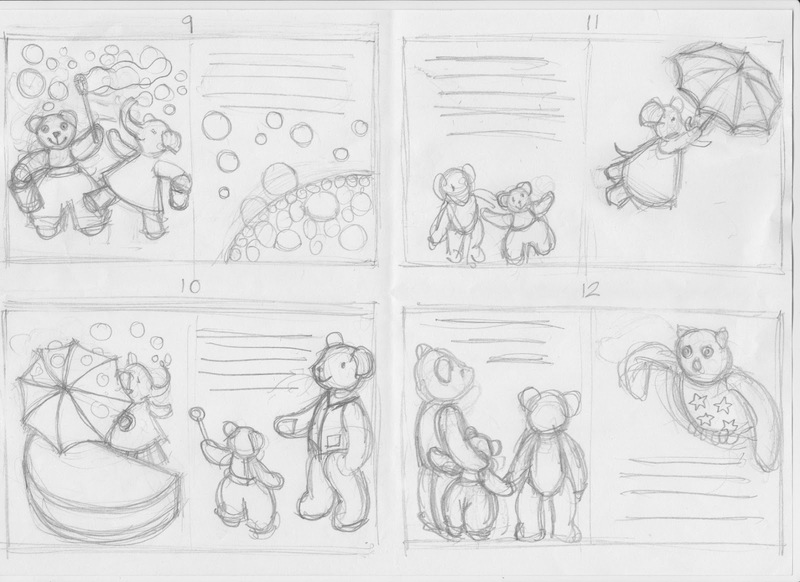 I have been writing and illustrating the Old Bear books for 30 years now. When I worked on my first book ‘Old Bear’ (published in 1986) I put a huge amount of effort into the initial sketches and plans; adjusting and re-drawing every spread until it was fine-tuned and as close to the finished thing as possible. As an unknown illustrator I had to show what the finished book would look like. 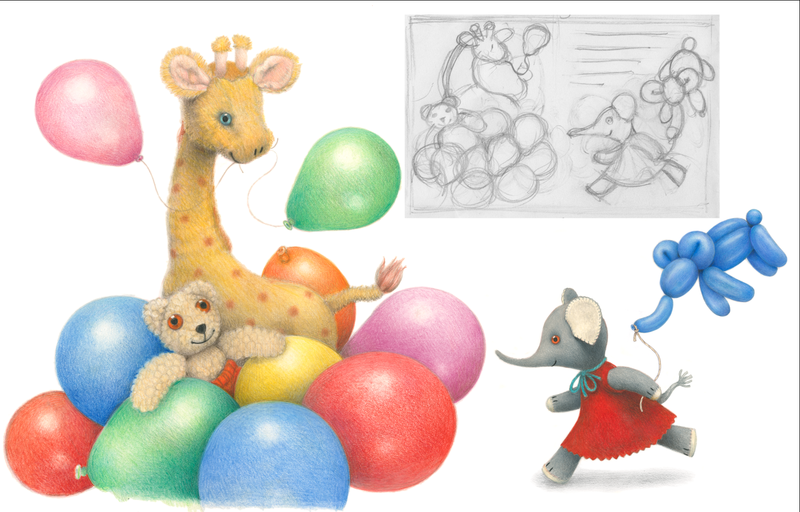 The roughs were drawn to scale, coloured and as detailed as possible. Over the years my roughs have become rougher. 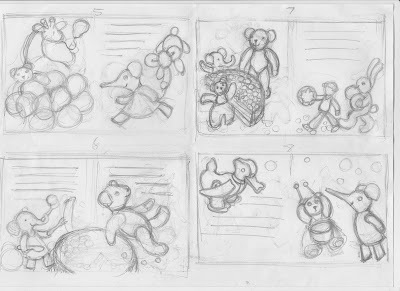 I know that everyone knows my style so I don’t have to show technique in my dummy books - just layout and content. 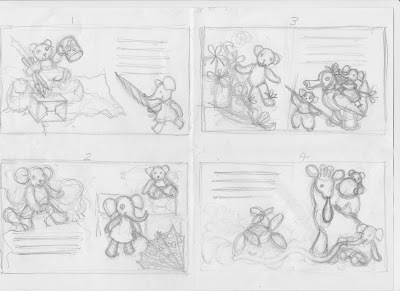 The design of the page is the important bit and I often find that drawing very small (thumbnail sketches) is the best way to begin. 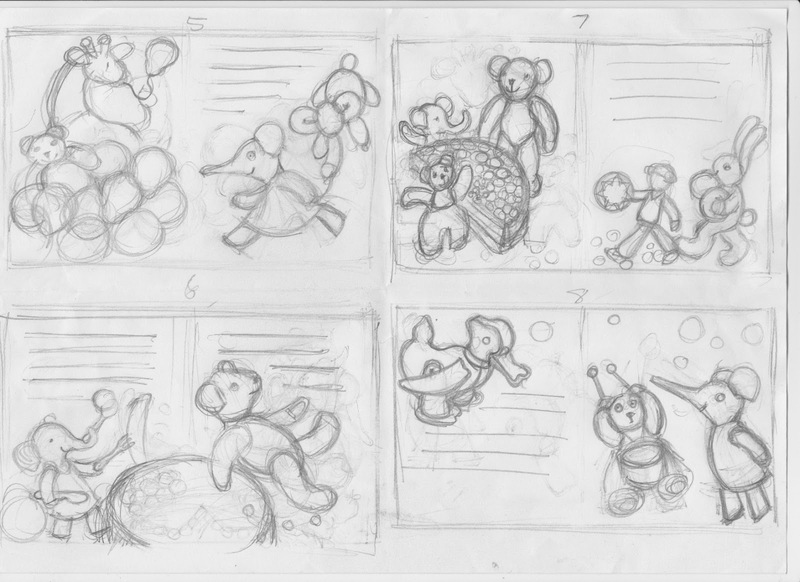 I have ‘seen’ the whole book in my mind and getting it down on paper is usually speedy and spontaneous. Often it is done ‘on the back of an envelope’ very early in the morning; when nobody is up and the phone isn’t ringing and there are no emails to reply to. 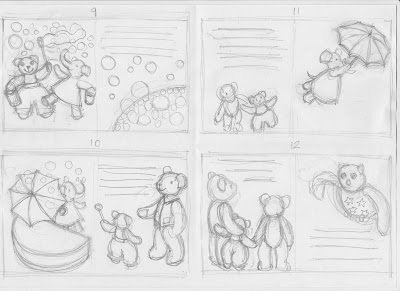 The sketches you see here are my initial ideas for my latest book; ‘Happy Birthday Old Bear’ and they were drawn on a train journey on a few loose pieces of A4 paper. 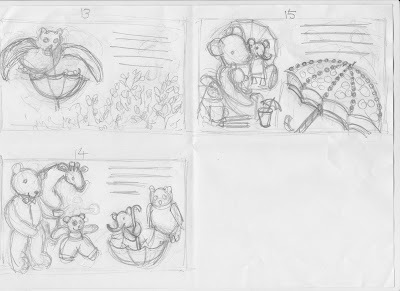 I worked from these simple roughs for many months and found that on the whole, few changes of layout were required. In other words; the whole book was already there, it just needed many hundreds of hours of drawing to bring it to fruition. 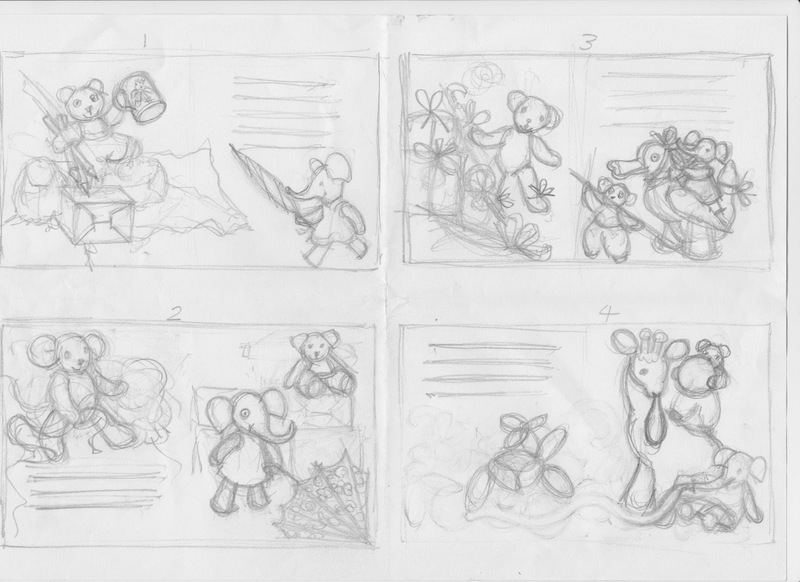 I scanned the sketches as soon as I got home (to send to my publisher, Salariya Books) and it’s a good thing I did because the originals are now grubby, faded and tea stained. And after many months of work I now have the finished copy of my 30th anniversary book in my hand. Very satisfying!